Ideal for lounging around the house, working out at the gym or a Saturday slumber party. These sweatshirt fleece shirts are warm and cozy. Available in your choice of solids or prints and also the classic sweatshirt gray. In-stock inventory is lengthy. Please contact us with your request so we can check if your color choice/size is available. If not in-stock, we will require 2 weeks sewing time to get one made. 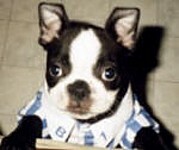 Boston Terrier dog shirts will make any Boston look daper and ready for a day or night out on the town. Our dog shirts come in many colors and styles to accomidate a variety of tastes. Be sure your Boston Terrier has his or her nicest dog shirt on when you go for your next outing together. Click on the pictures below to see a larger picture of that praticular Boston Terrier shirt. **When checking out please give us the length from your dog's neck to tail & the measurement around their neck so we can send the proper size sweater in the special order instructions block. Opened dog apparel cannot be returned for a refund due to sanitary conditions. Medium-Heavyweight Unisex Dress Shirt/Jacket of faux fur (Your choice of black or white) and trimmed with a faux fur animal print collar. Closes down the front with hook and loop closures. Nylon or cotton camouflage shirt, available in jungle camouflage (shown - cotton), desert camouflage (nylon) or woodlands camouflage (cotton). Shown with the optional "boonie" hat sold separately. Beautiful Happy Halloween Shirt for Lightweight, cool cotton unlined shirt. Fastens in the front with hook-and-loop closures. Fabric it is now made of is on the left. Lightweight, cool cotton unlined shirt for casual or dressed up wear anywhere. Suitable for male or female dogs. Fastens in the front with hook-and-loop closures. Available in black or pink checks. Look good in the city - or visiting Grandma's Farm! This smart denim shirt is trimmed in our "cowdog" fabric on the collar, around the sleeves and also features a simulated vest pocket. Hooded Dog Sports Sweatshirts for sports loving dogs and people. Score big profits with Zack & Zoey Sweatshirts designed to appeal to your sports fan customers. Choose from four silk-screened logos. Comes in your choice of Red Baseball Shirt, Black Basketball Shirt, Green Football Shirt or Navy Soccer Shirt. Includes hood and handy kangaroo pocket to store treats or ID Ribbed cuffs and waistband provide a cozy fit for active dogs Machine-washable poly/cotton blend. Send us your picture in jpg format to linda@bostonterriergifts.com along with any wording you desire (keep it short please) and we can create a T Shirt just for you. FYI: white is the easiest background with most pictures. Sometimes the color of the fabric shows through the picture. We will e-mail you a picture of the shirt for you approval before we ship you the shirt. Create the perfect fashion statement for your pet with custom pet clothing! Add your photos, text, and designs to create a pet t-shirt that is matched by none in quality and comfort. Your pup will be styling in this 5.8 oz, 100% combed, ringspun cotton baby rib tank top. * Available in 6 colors and 7 sizes! Contrast double-needle ribbed binding on the neck, sleeves and bottom seam provides a comfy fit for your furry friend. Select one size up for long-haired dogs. *Heather is a 90/10 cotton-poly blend. XS 1-3 lb. 8 1/2" 11"
S 4-5 lb. 9 1/2" 12"
M 6-10 lb. 10" 14"
L 11-25 lb. 12" 16"
XL 26-45 lb. 14" 19"
2XL 46-55 lb. 17" 23"
3XL 56+ lb. 18" 29"